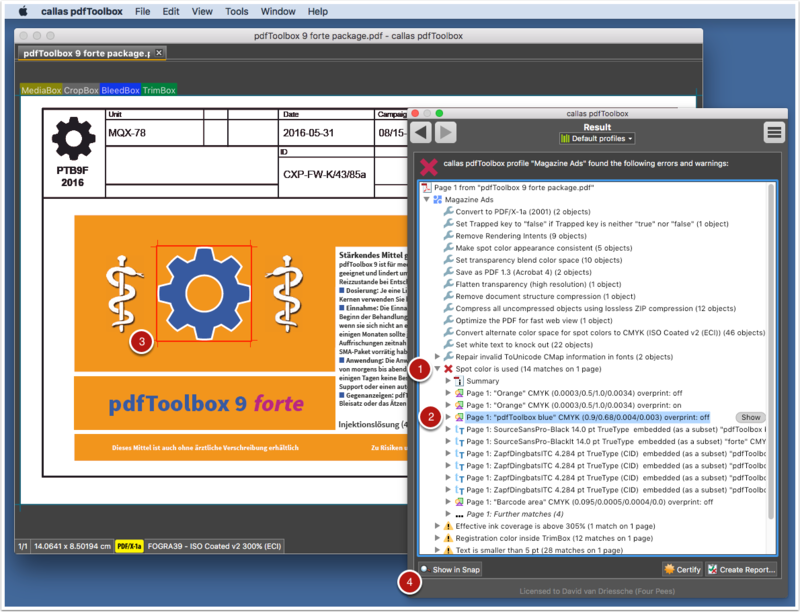 pdfToolbox uses profiles to perform quality control and/or to fix PDF documents (read more about profiles in this article Profiles: the corner stone of pdfToolbox). This article explains how you use those profiles and how you can drill-down in the results of using such a profile. To use a profile, first open the profiles window by using the "Tools" > "Profiles" menu item. Open the PDF document you want to check or fix. Select the profile you want to use. You might need to open the profile group first (by clicking on the gray triangle in front of its name). Click the "Analyze" or "Analyze and fix" buttons. When you only want to know whether a PDF document is good or not, click the "Analyze" button; this only does quality control and will never change the PDF document: in the profile you have selected, it will only execute the checks. 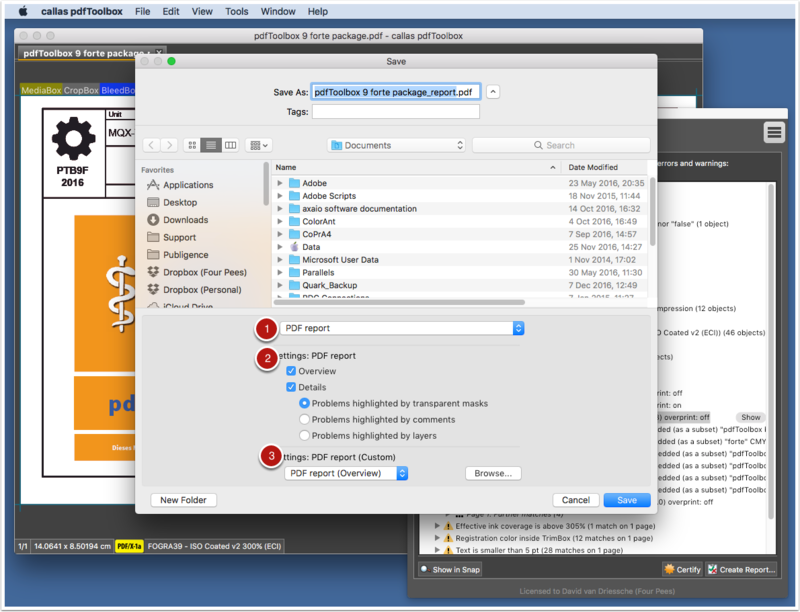 If you also want to run the fixups in the profile you have selected, click the "Analyze and fix" button; if you do so, pdfToolbox will ask you where to save the resulting file as this time you might change the document. While pdfToolbox Desktop is processing the PDF document, you'll see a progress window that informs you of which fixups have been run or what messages are reported about the PDF document. When processing is done, this progress window becomes the "Result" window you see below. The result of processing. In this case a red cross indicating there was at least one error detected. A list of all fixups that were actually performed on the PDF document. The profile may contain many more fixups, only those fixups that were necessary are listed here. A list of all warnings issued by preflight checks in the profile. A warning is an item that may be an issue but doesn't have to be. It's something that needs to be checked. A list of all errors issued by preflight checks in the profile. An error is something that likely will be a problem later on. It's something that needs to be fixed. 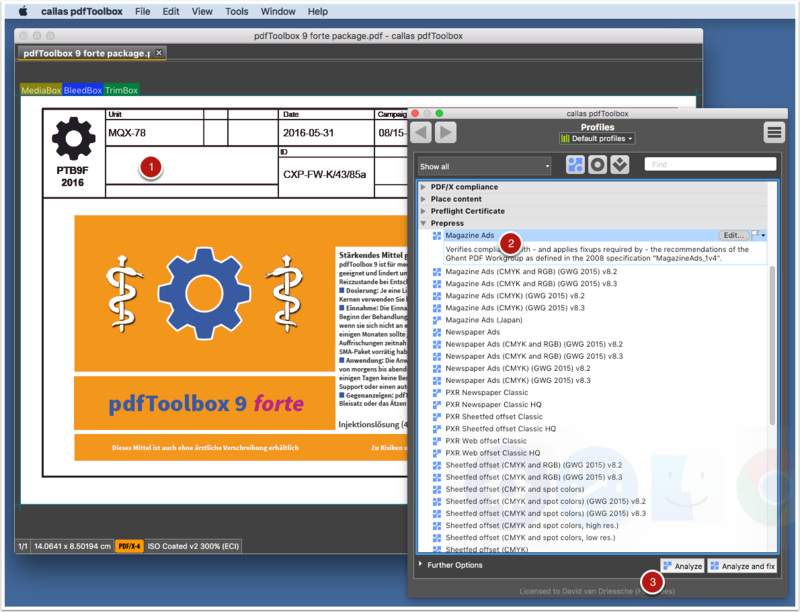 When pdfToolbox processes a PDF document using a profile, it will first run all fixups in the profile and then run the preflight checks. If something in the PDF document was wrong, but it could be fixed by a fixup, it won't appear in the warnings or errors. If a warning or an error is reported, it's because they could not be fixed by the profile and they need to be dealt with otherwise. It's often helpful to know exactly where on the page a warning or error occurs. Click on the triangle next to the warning or error message you're interested in. A list of objects that cause that particular warning or error appears. Double-click on the object you are interested in. You can open the triangle in front of it to open more details about it. A red outline (for errors) or yellow outline (for warnings) appears on the document at the location of the object you have now selected. You can click the "Show in Snap" button to open a separate window where just the object causing the warning or error is shown. When you want to create a preflight report of what you see in the "Result" window in pdfToolbox Desktop, click the "Create Report..."button. PDF Report: a simple, non-customizable PDF report. Select the options under ⓶ to select what details you want to include and how you want to highlight warnings and errors. PDF Report (custom): a more modern PDF report based on an HTML template you can modify. Use ⓷ to select the HTML template you want to use. Text: a textual version of the result information. XML: an XML version of the result information.